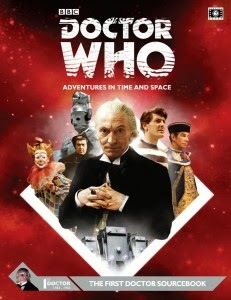 As its title suggests, The First Doctor Sourcebook is wholly devoted to the adventures of the Doctor as portrayed by William Hartnell that take us from an encounter with An Unearthly Child in a junkyard on Totter’s Lane to the Doctor’s first encounter with the Cybermen on The Tenth Planet. It presents an opportunity for the Doctor – or indeed, the player character Time Lord and his Companions to be wanderers in the Fourth Dimension. To visit Skaro for the first time; to visit the past and travel the Silk Road to far Cathay; to foil the machinations of Mavic Chen; to become the reluctant playthings of the Celestial Toymaker; and more. The second part of The First Doctor Sourcebook is further divided into chapters that travel chronologically in order through each of the First Doctor’s adventures. For each of these there is a synopsis followed by a guide to running the adventure and a listing of any appropriate characters, aliens, and gadgets. The guide to running each adventure is not a straight forward adaptation, but rather a discussion of themes and ideas inherent to the adventure. So for example, with An Unearthly Adventure the authors examine how Barbara and Ian are brought into the TARDIS and then discuss what lies at the heart of the encounter in the prehistoric – the desire for an object, in the case of An Earthly Child, the object is fire. The nature of the object is irrelevant, but how it can be used to tell a story is and that is the point of the examination. In presenting a fully stated up Stone Age Tribesman, they also discuss the possibility of playing a Companion from a primitive time. Rounding the entry for each story is a selection of Further Adventures hooks that could be run as possible sequels. Advice and extra information like this continues throughout The First Doctor Sourcebook. So for example, there are stats and write ups for the very version of the Daleks from The Daleks; how to handle long journeys and the theft of the TARDIS as in Marco Polo; on using telepathy in The Sensorites; and how to portray non-human or non-humanoid characters as in the Menoptra, Optra, and Zarbi of The Web Planet. In all of these it does not present extensive write ups of every character to appear in each episode – that would take up a great deal of space and anyway, these are easy enough for the GM to create by himself. The pertinent ones are given though, except for one odd omission, that of the Meddling Monk from The Time Meddler. As a renegade Time Lord, his stats and a fuller write up can be found in The Time Traveller’s Companion. Rounding out The First Doctor Sourcebook is a set of characters for every one of the Companions who accompanied the First Doctor on his travels. Physically, The First Doctor Sourcebook is a slim hard back book, suitably illustrated throughout with black and white photographs – hopefully by the time Cubicle Seven Entertainment gets to The Third Doctor Sourcebook it will be in colour. The volume feels solidly researched and well written, but if there is a downside to the book, it is that not going to appeal or be of use to everyone, and that is going to be an issue with each of the subsequent volumes in the series. After all, almost everyone has their favourite Doctor and also their least favourite Doctor, and that may be reflected in the Doctor Sourcebooks that they purchase. With The First Doctor Sourcebook, the adventures presented here may not be as dynamic or as knowing or as exciting as those of new Who, but there is nothing to stop the GM from bringing those elements to the Hartnell era or treating the era as a change of pace. Or indeed as a starting point for a campaign that revisits each of the eleven eras of the Doctor.